The Chris Houlihan's room in the US version. Before the game's release, the American magazine Nintendo Power ran a competition, with the grand prize winner having their name in a secret room in the game, a room so secret that few would find it. The winner's name was Chris Houlihan. The room itself is nothing special. It contains 45 blue Rupees (that's 225 Rupees!) and a telepathic tile that says, "My name is Chris Houlihan. This is my top secret room. Keep it between us, OK?" When you exit the room, you appear in front of Link's house. 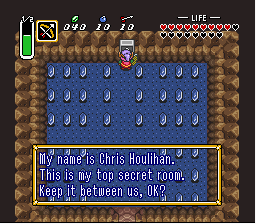 Over time a variety of methods emerged for entering the Chris Houlihan Room; most centered around quickly dashing from a saved point to the secret bush entrance outside Hyrule Castle. These methods did not always work, but it was unclear why. Finally, after carefully studying the game code and observing why the room was loaded sometimes, some players found a way to enter the room consistently. It seems that it has to do with Link's location on screen when he changes screens using the Pegasus Boots. Most methods of reaching this room center around starting from some point (mainly the Sanctuary or Kakariko Village) and then using the Pegasus Boots to reach the secret passage outside the castle. It is commonly held that Link has to get there as quickly as possible, ideally without being delayed by enemies and walls along the way; in fact, speed has nothing to do with it. The only thing that matters is Link's position when he does the last screen transition to the south. To be able to enter the room, you have to not only be dashing when this transition occurs but also be on one of the two lowermost pixels of the screen. Dashing with the boots moves you 4 pixels each frame; if you start dashing from a random position, there's only a 1/2 chance of crossing the threshold correctly. Because of this even the most common methods are not totally reliable, but this has been thought to be because the player was not fast enough. 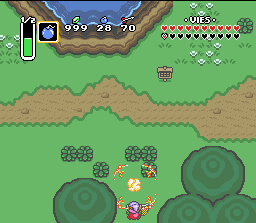 Drop a bomb so that the blast pushes Link to the bottommost pixel of the screen. Note that this will not work on the Game Boy Advance version! For this method, all you need are the Pegasus Boots and at least one Bomb. Exit the Sanctuary, and go one screen West. Now go to the bottom of the screen (the path that leads to the small forest west of the castle) but don't change screens. When you're close to the lower border of the screen, face up and drop a Bomb. The Bomb blast should send you South but you won't change screens (see screenshot), and if you were close enough to the lower border, you'll be standing on the lowermost possible pixel (or maybe one above this, but it's not a problem). If you aren't this close to the bottom, use further bombs to push Link closer to the edge. Once you are at the very edge, start charging a dash with the Boots (while still facing up), and, while charging, press to turn around and face down (this is to turn around without moving, which would result in screen changing and thus make this method fail). Keep charging until the dash starts and takes you to the next screen (to the south). From this screen, go to the east (towards Hyrule Castle) and change screen one last time. When you enter the Hyrule Castle screen make your way to the secret passage hole (that's on the east side of the screen). Cut the bush, and jump in the hole from the south side. Entering from other sides will not work. If done correctly, you'll appear in the room. Because this method only requires correct positioning, rather than the speed previously believed in, it does not matter how much time you take, or where you go on these screens. The only places you can go that will cause the trick to not work are going off the route described above or, after gaining proper access to the Dark World, walking through the gate into the castle. Once here, walk to the right through the wall. You can also use a cheat to reach the room: choose to Start From Sanctuary, and activate the "Walk Through Walls" cheat code (7E005EFF). Walk through the door to the south. If you succeeded you'll end up in the room with levers. Once there walk through the wall to the east until you reach the Chris Houlihan Room. What causes the game to load the Chris Houlihan's room is not yet entirely understood. It is believed that the room was intended as a failsafe; if there is a fatal error when the player changes rooms, the game dumps Link into the secret room. 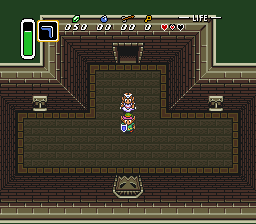 Most often it occurs when Link falls down into a hole leading to another area; it is known to be possible from the secret passage hole next to Hyrule Castle, the faery hole that's east of the cemetery, and the hole on top of the Pyramid of Power (where the final battle takes place). There are possibly other ways to enter the Chris Houlihan Room, but they are rare and do not work with any degree of accuracy. Because the contest was held by Nintendo of America, Chris Houlihan's name only appears in the US version of the game. However, the room does exist (and can be accessed in the same way) on all SNES versions of the game (including the Wii Virtual Console's emulated versions). In all non-American versions, the telepathic tile simply says that it is a secret room. In the GBA port of the game, the previously known ways of entering the room don't work and no-one has yet managed to enter it without cheating, even though the room does exist (as can be seen by either cheating or using glitches). The telepathic tile has been removed completely in the GBA port. This page was last edited on 8 July 2013, at 20:31.